In the centuries before flossing, fluoride and Waterpiks became standard in human populations, tartar would build up on teeth in layers, sometimes creating dental superstructures of majestically disgusting size; see the technicolor example on the right. Now researchers from the University of Nevada, Reno have discovered that small samples of plaque removed from the teeth of ancient human remains can reveal information about the food they once chewed. 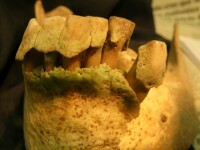 Analysis of stable isotopes like oxygen, strontium, lead, carbon and nitrogen performed on teeth and bone can provide a wealth of detail about ancient diet and migration, but the analysis requires the destruction of the sample. Museum curators are obviously not keen to allow destructive procedures on the remains in their charge, but since dental calculus is technically an accretion on the body, scraping off bits of it and destroying them doesn’t count. [Researcher G. Richard] Scott obtained samples of dental calculus from 58 skeletons buried in the Cathedral of Santa Maria in northern Spain dating from the 11th to 19th centuries to conduct research on the diet of this ancient population. After his first methodology met with mixed results, he decided to send five samples of dental calculus to Poulson at the University’s Stable Isotope Lab, in the off chance they might contain enough carbon and nitrogen to allow them to estimate stable isotope ratios. Extracting collagen requires dissolving the bone samples in multiple acid baths. It’s time-consuming, dangerous, expensive and highly destructive. Scraping off a small amount of plaque from thousand-year-old dental stalactites is quick and easy. Then all you have to do is grind it up and put it in the mass spectrometer to find the stable isotope ratios. If this procedure turns out to be repeatable and accurate, our long, scabrous history of poor dental hygiene will finally have meaning.